We all want these types of images and expressions from our photography sessions. Not all babies are as outgoing as Virginia, but our top priority is always to capture your baby and his or her personality at this particular moment in time. 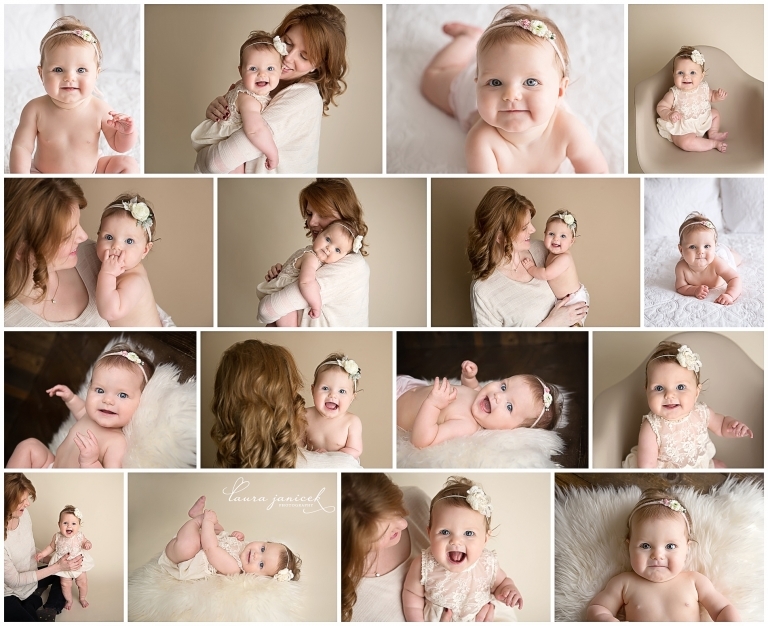 Virginia was a little into her sixth month for her pictures, which is not uncommon for my Watch Me Grow clients. We like to give baby a little extra time to get confident with sitting up before photographing this milestone. The ability to sit up allows us to capture better expression and personality in the final images. As you can see, we did not use many props with this session as we wanted to focus most on Virginia’s expressions, growth and relationship with mom. We were able to get a good variety of images for her final gallery without adding any unnecessary props or distractions. Her personality definitely shines through in these pictures! We typically schedule these sessions several weeks out. I recommend planning on reaching out at least 6 weeks ahead of time to allow us some flexibility in coordinating dates. It’s often a bit of a guess as to whether baby will be sitting up or not, so we check in as the session gets closer. If she’s not going to be ready, we’ll start looking at other dates. Rescheduling is not always easy, but I really think you’ll be happier with your photographs in the long run if your baby can fully engage with us during her photo shoot. There are other circumstances when we should reschedule your session. These include if baby is sick, has an ear infection or is just now coming down with or getting over an illness. We can typically see ‘illness’ in the baby’s eyes in their pictures. A worse situation is that baby is so fussy and unsettled during the session that we can’t even get him or her to look at the camera.